I turn off the alarm. It is just after 6am on a cold, overcast Thursday. The idea for this expedition surfaced several days ago, while listening to the news on NPR. I have been imagining different scenarios and looking forward to a minor adventure, but at this moment I waver. I lift the cat off my neck, trying not to wake her, and get up anyway. On my way out, I detour to the kitchen and remove two eggs, secreting them to an inside pocket of my winter coat. I hope my wife won’t notice them missing. I have to remember to be careful not to bump my chest into anything. I leave through the kitchen door of our comfy brick bungalow in suburban DC, kick the car to reluctant life, and drive to a nearby Metro station. There is almost no traffic. The Gray Man is master behind the government-issue desk, in the gray building, in the gray city, under gray skies brooding over a dun land. His eyes are small, sunk in over-sized sockets. They stare, implacable, dark steel. The Gray Man’s eyes are a lifetime of empty, devoid of emotion, of empathy, of kindness. Of humanity. His mind is narrow and rigid—like his tie, like his long nose—its machinations not reaching his eyes; this is by design. His conscious time is spent plotting, staying two steps ahead of his subordinates, of his superiors, of the authorities, of Stalin. The emptiness of his eyes protects his position, his life. For, in the gray city, to let slip one’s thinking, one’s emotion, if it exists, one’s thoughts—this invites scrutiny, danger. The Gray Man is careful, meticulous; his eyes reveal nothing. What is going through his mind? Does he look at his wife this way? Cold and sleepy, I climb the stairs from the Metro Center subway station, cross the street, and make my way toward Pennsylvania Avenue. A Metro bus blocks my path, forcing a detour. Budget constraints, I suppose. Or somebody’s novel idea. I walk, feeling the deep January chill seep through my pants, my shoes, my gloves. Left and right, I can see snow-lined, icy streets cordoned off by concrete Jersey barriers, and more slumbering buses. I am five hours early, so I do not have to struggle through crowds yet. A gloomy oppression hangs over the city. Even this early, the presence of authorities intrudes. Two TSA employees are nearby. TSA personnel? What are they doing here? The two women, despite their dark blue pants and thick padded coats, the multiple officious patches on their arms, and the “TSA” emblazoned across their backs, look friendly, non-threatening; the one with the short curly gray hair even smiles. Neither one swaggers. I walk past a building with flags out front, two American and one I don’t recognize; an embassy, perhaps. At the corner of 12th Street, a man stands by a Jersey barrier and points. He is asking a camouflage bedecked military man for directions to somewhere. Now I can see my involuntary goal: a block down, a pavilion stretches across 12th Street; makeshift chain link fencing funnels us into the maw of a checkpoint. It will take only fifteen minutes for me to get through. Later I will learn that authorities closed a number of these already-few access points, forcing people wait two and three hours to get through. A half-dozen more men in camouflage mill about, trying to look important instead of bored, stamping their feet to get warm, to feel their toes again. Two are talking with civilians. One nearby glares at me, and at my camera, but doesn’t say anything. I resist flipping him off. The military men wear no identifying insignia, so it’s not clear which branch, or agency, or contractor, they’re from. Maybe the National Guard. Their dark glasses are incongruous in the dim, early gray light. Security is more paranoid than I had thought it would be. How little did I imagine. The Gray Man is the son of a tailor. Yet he wears a nondescript gray suit that is too big for him. Or perhaps, in his small frame of flesh and bone, he is too small for the suit. The sleeves are almost too short and his wrists are bare. He does not wear a watch. His nose is thin, and long for his face. A small, neatly kept mustache sits above his small mouth. He has dark hair, impeccably neat and trimmed, receding and streaked with gray. The tie he wears is dark, with a small, tight knot that rumples the collar of his starched white shirt. When he smiles, he is almost handsome. He rarely smiles. His posture, the set of his arms on his desk, his face, despite dead eyes, exude authority. He is calm and practiced, accomplished, and he wears it well. I stand in line at the checkpoint. A swaggering browbeater with appropriately chiseled Aryan features and wearing a police uniform—dark blue police jacket, badge on his breast, radio mic clipped to his left shoulder, starched white shirt and a narrow black tie under the jacket, holstered 9mm gun on his right hip—blusters up the line straight to me and insists I stop taking pictures with my little Canon point-and-shoot. He has no such authority. What is it about these men that they have to derive their sense of worth from putting on a belittling facade? Yes, Mr. Policeman, I get that you are important and must make sure we all know this. What are you really trying to protect? I forget what exactly I say to him, but he backs down and goes in search of someone else to impress. I am at the front of the line. About thirty feet ahead, under the white canopy, which is larger than I had thought, are four gray-framed whole-body scanners, with rented folding event tables and more uniformed people in between. Beyond are more Jersey barriers and another bus blocking the street. I soon find out the scanners detect more than just metal. Hiding behind an assumed authority in the face of threatening authority is an art form; I am a neophyte. His desk is his, and it is not his. Dark, squat, it presides over this room on the second floor of the gray building, unsubtle, unforgiving, as the unsubtle, pitiless Gray Man sitting behind it presides over the lives of men (and they are all men) he does not know, will never know, can never know. For a government-issue desk, it is ostentatious. Though not overly so: it does not cross the line of attracting too much notice, of inviting scrutiny. If it has been beaten, its scars are well hidden. Someone has polished the stained wood of the desktop. It gleams, and reflects the man behind it. For that is its function. The funny-looking portal starts beeping and flashing its lights as I step under its frame. I roll my eyes and pull out my camera, keys, and flashlight—the only substantial metal on my person—and the man facilitating this small set of a Kabuki theatre sets them on the table. I try again. Beeping, lights. He thinks to ask me if I have any food with me, a sandwich perhaps. He is friendly and courteous, which surprises me a little. But I have no choice but to unzip my coat, reach into the inside pocket, and hand over the two uncooked eggs I’d hoped to smuggle in. He takes them, tells me I can’t bring these in with me. Technically, he has to assume the eggs are my lunch. He hands me my metal items, gives me a knowing smile that says he might have tried the same, and I’m on my way, relieved. These machines are smarter than the ones at the airports. This man is quite unlike Mr. Policeman. A long, slender pen with a light brown wood barrel, impeccably neat, sweeps back, graceful yet stark, from a black holder at the front of his desk. He does not use this pen, favoring instead featureless, utilitarian, government-issue black pens. A black rotary phone is to his right, far enough away to show that the papers before him, the business at hand, are more important. But it lies within reach, just in case. Across from the heavy wood desk, incongruous in this spartan gray room with the dark wainscoting, sits a plush wingback chair, bright red, facing the desk. Dividing the space between the desk and the red chair, two rows of buttons line the edges of the desktop—like the graceful pen, meant for conveying a message. They tell the clenched-fisted men standing, shaking, before the desk, “I am above your station, I am important, valued; you are not.” For these miserable men, it is a terrifying tableau. But is the man hiding behind the desk, dutifully meting out doom, any more sure of his position than they had been? A perfunctory portrait of Stalin hangs on the far wall. I make my way along Pennsylvania Avenue, searching for what I think might be a good place from which to view the coming events. Workers are busy setting up metal risers all along the street. A 20-piece band across the street, in front of the ornate Old Post Office Building, plays patriotic tunes; they are miserably cold, their only audience being workers putting up barricades and heavily geared police stamping their feet. A squadron of troops in gray-green uniforms and overcoats marches smartly by, in stark contrast to the unkempt milling of the bored police. Army, perhaps. They march four abreast, and the column goes on for more than a block. I pass a so-called “Designated Demonstration Area”, an absurdly small, 25 by 25 foot area on a corner, boxed off with yellow police tape, black bold “POLICE LINE DO NOT CROSS” tickering around its circumference. If we want to yell, and protest, this is where that’s “allowed”. Each of the many press areas, set aside for TV production crews whose members far outnumber the cardboard pretty-people who dutifully recite the lines prepared for them, is noticeably larger, blocking the wide sidewalks. They, too, are cordoned off by yellow crime scene tape. Somebody’s idea of a cynical jab at the absurdities imposed upon us? I have no wish to be near these and so walk a few long blocks further. I stroll along the sidewalk fronting the squat, J. Edgar Hoover Building, headquarters of the FBI. The architecture, black granite facing, and narrow, fortress-like window openings of the building are striking. A pair of police, clad in riot gear and brandishing ash-colored three-foot billy clubs, accost me for having a camera. They know they have overstepped. It is almost comical to watch them search their minds to justify their intimidation. One accuses me of trying to take pictures of the inside of the closed building. Through the thick slabs of black granite, I presume. Incongruously, American flag patches are on their right shoulders. Do they have no shame? To hell with them. I take more pictures. I hear in passing a couple of troopers at the curb, more bullies joking overly loudly, promising to “toss” one another a “liberal or two”. Somewhere past 9th Street, I find a likely viewing spot right at the curb. Four rows of police, the third row in full riot gear, and a fifth row consisting of Navy enlisted stand between us and the street. The police appear to be mostly from Virginia; they are rowdy, ill-mannered, clearly hoping they might get to break some heads today. By now, more people have arrived, yet we will remain outnumbered by “security”. Such brave men, these. I find myself among a group of thirty or so like-minded angry people. And one lone supporter of Dear Leader—an older man, former military. I feel bad for him; this is not his fault, and I wonder if what is happening here, the reasons, the context, might be beyond his ken. Age is the great ossifier. Those of us near him watch out for his well-being, and form a buffer around him, even though we hold adamantly opposed world views. A seasoned, gray-haired man in a Virginia State Police uniform and barking into a walkie-talkie, clearly someone in a leadership position, breaks from the phalanx of cops and heads straight toward a twenty-something next to me, then proceeds to verbally assault the kid. It turns out he’d just made a snide joke to his girlfriend on his phone. They are monitoring our cell phones. I look up. Snipers walk the rooftops of these classical monumental symbols of freedom, and several helicopters buzz about, patrolling. High up, an AWACS plane is circling the area. Inside lie the ears that picked up and pinpointed the kid and his joke. Impressive technological demonstration. I snap a picture. Welcome to America, land of the brave and the free, I think, and not for the first time this gray day. The small Gray Man with the unremarkable pen in his hand and the officious papers on his desk is Gábor Péter, a man hated and feared. He is at the crest of his power, though he does not know this yet. In his rumpled gray suit, starched white shirt, and dark narrow tie with the small tight knot, he calmly presides over his gray office from behind his dark government-issue desk, across from the padded red chair, in the house of terror with its thick—to hide the screams—gray stone and cement walls and floors, home to torturers by day, famous for their brutality, and by night to condemned men in its squat gray bowels, snatched from streets and beds, their broken bodies shrunken from escaped hope, arms over their ears to muffle the agonies of friends and neighbors and comrades screaming, impossibly still screaming, from pointless torture, huddled for weeks on hard, narrow wooden benches bolted to the walls in claustrophobic basement cells swimming in excrement and piss and sweat and fear, on the northeast corner of the wide boulevard at 60 Andrássy út, across from the Music Academy, a few blocks from Heroes’ Square, on the Pest side of the cold gray Danube, under the baleful skies of communist Hungary. Gábor Péter is the new Chief of the State Protection Authority (Államvédelmi Hatóság or ÁVH). Ahead lie seven more years of dispensing dispassionate, brutal inhumanity before he, too, fails to stay a step ahead of Stalin’s ever-growing paranoia. 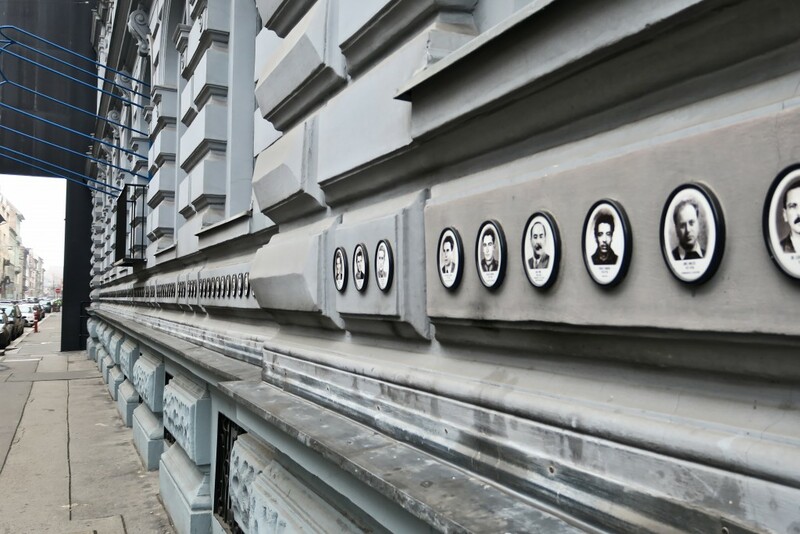 Victims adorn the walls of the Terror House on Andrássy út. The small man hiding in back of the armored limousine…or perhaps it is that armored limousine—two of them scream past going forty to fifty miles per hour—is George W. Bush, newly reelected (fairly or not is another matter) President of the United States. He flies by too fast for me to even snap a picture. I look at the crowd, and the police, all of them agitated. I spy a lone Navy person in dress blues at the nearby intersection. Stoically at parade rest until now, she smartly comes to attention and salutes as the limos fly past. Her comportment, her discipline despite the numbing cold, her dignity, are a stark rebuke to the remarkable lack of such among the hundreds of troopers and police. The contradiction is disturbing. I still wonder what was going through her mind that whole time; her demeanor revealed nothing. This small man is hated by some, maybe even feared. I think that is a shallow view. It was clear even four years ago that this, too, is a man living in circumstances only partly within his control. The men around him, and the state apparatus in which he is embedded, require of him a certain behavior, a certain projection of an image which may or may not be an accurate reflection. Our countries, the United States and Stalin-era Hungary, are tremendously different states. Yet both brandish a threatening, cold, implacable authoritarian scaffolding to which its respective minions, if they are to survive, must conform. It is January 20, 2005. 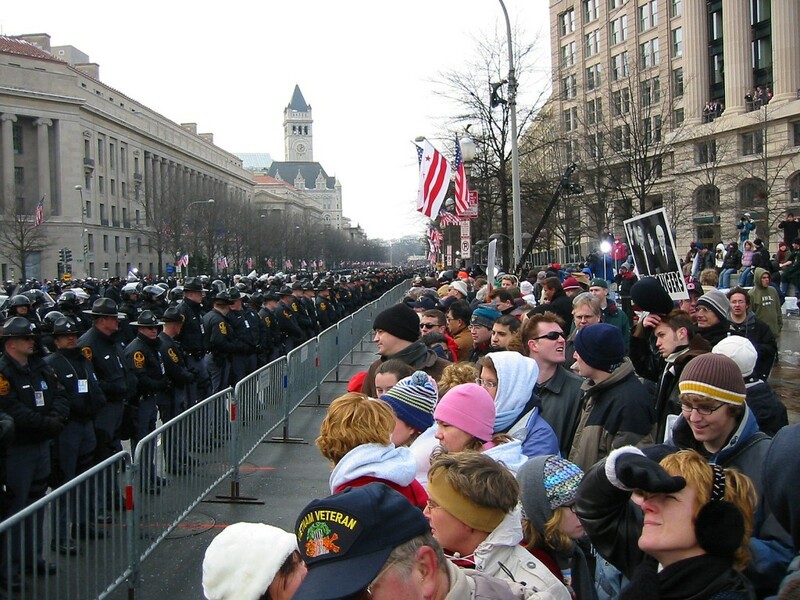 Inauguration Day, 2005: View towards the White House.